I wanted a decent watch for using everyday, it needed to be thin and light and not scared to get wet. Had to be a rubber strap as metal links rip my hairy wrists. Got features I probably wont use but it keeps time very well. Overall the watch is fantastic value and meets all I need it to do. The most reliable time you can buy. 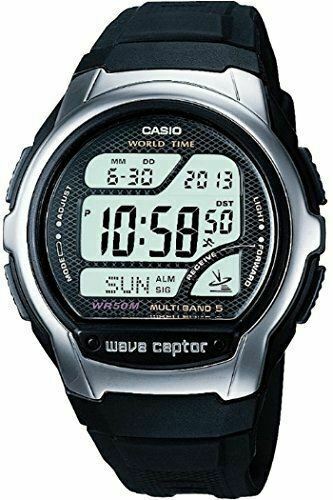 I have two Casio Wave Ceptor Watches. Why ? one for daytime use, and one for special times. For Value and Price , You won't get better. Also when travelling they will adjust to the time of the Region your in. They are all waterproof so can be used when swimming on holiday, And they will adjust to correct time come Spring/ winter , without you doing anything. And with alarms, You will always be spot on time. Great watch,clear didgital display,keeps excact time. This watch is a little bulky, but it is good to have a watch that is exactly right, and which knows about summer time and changes automatically. To get the time signal you have to be careful how you position it in front of a window at night. Mine on occasion loses everything and reverts to 2005 - probably a loose battery. But each time it has eventually recovered itself. I do not know if this happens to others, but I notice there are a lot of secondhand ones on eBay, which may be a bad sign. i have now bought a secondhand one as a backup, and the two should fill the bill.